[SatNews] Members of the 1st Space Operations Squadron gathered to celebrate the Space-Based Space Surveillance Satellite's (SBSS) fourth anniversary on orbit recently. 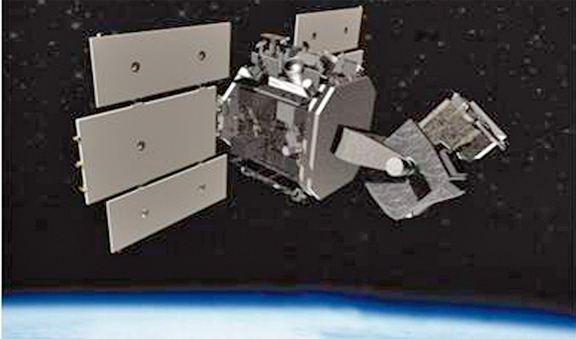 An artist's depiction of the Space Based Space Surveillance satellite. The Joint Space Operations Center uses data collected from the SBSS to track orbiting objects in geostationary low and medium earth orbit, providing space situational awareness to U.S. military and commercial space users. Members of the 1st Space Operations Squadron command and control the satellite. Image is courtesy of U.S.A.F. The event provided an opportunity for squadron members and leaders to celebrate mission success as well as helped to fortify a new identity for the 1st SOPS, which has transitioned into a space-based, space situational awareness squadron in the past 12 months. While the squadron has commanded and controlled SBSS since it reached orbit in September 2010, it also gained a new space situational awareness system, the Geosynchronus Space Situational Awareness Program (GSSAP), this past summer. In June, Air Force Space Command leaders directed the 1st SOPS to add command and control of GSSAP to its portfolio of situational awareness systems, which includes the SBSS and Advanced Technology Risk Reduction (ATRR) satellite. "With leadership's decision to make (the) 1st SOPS a space-based SSA squadron, we begin the work of truly operationalizing SSA to where the Joint Functional Component Command space commander will receive truly actionable information," said Lt. Col. Toby Doran, the commander of the 1st SOPS. "Moreover, by gaining synergy among SBSS, ATRR and GSSAP, we can say that space superiority starts in (the) 1st SOPS." SBSS plays a large and significant role in the space situational awareness realm. Built by Ball Aerospace Technologies Corporation and the Boeing company, SBSS uses a two-axis, gimbaled optical telescope to provide coverage of satellites and other objects in the geostationary belt. It is one of the few satellites on orbit that look out toward the heavens instead of toward Earth. The SBSS is a low-Earth orbit sensor that provides all-weather, 24-hour space situational awareness data to assist commanders throughout the military in detecting, identifying and tracking potential hazards in space. In essence, the SBSS helps provide a better understanding of the space environment. "The vehicle performs more GEO observations than any other sensor," said Capt. Jared Grady, the 1st SOPS lead SSA space vehicle engineer. "It also performs a significant number of deep space observations beyond the GEO belt." Grady also said that 1st SOPS analysts and engineers have continued to innovate during SBSS's lifespan, which has extended the satellite's capability beyond its original design life. This year proved to be an important one for both the satellite and the squadron as 1st SOPS members rewrote the vehicle's tactics manual. This not only helps operators understand the updated vehicle, but informs the SSA community about how SBSS contributes to space situational awareness. "When we consider a one-of-a-kind system like SBSS, we have no choice but to be innovative," Doran said. "There is no opportunity for material solutions, so we turn to our tacticians to get the most out of the system. They have done it and our new tactics manual documents that innovation." As the squadron opens year five of SBSS operations, the lessons learned and the experience gleaned from the system's performance will be invaluable as it embarks on year one of operating the GSSAP. "As we transition our mission sets, we're commemorating our success of another year on orbit (for SBSS)," said Capt. Brett Kasischke, the 1st SOPS chief of operations training. "At the same time, what's new and different is we're doing this with a vision of ourselves as an SSA squadron."